A one-of-a-kind guide to active, engaging learning strategies for aging studies. Harnessing the proven benefits of active learning strategies, this is the first activity book created for a broad spectrum of courses in aging-related higher education. 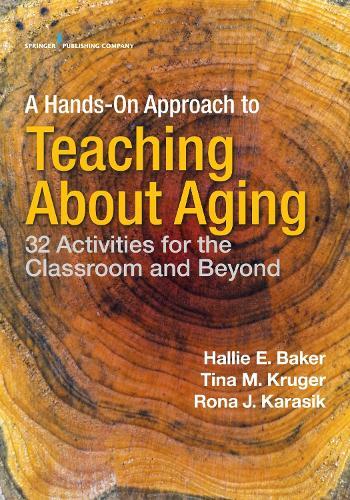 It features 32 classroom and community-based educational activities for instructors seeking to introduce and/or enhance aging content in their courses. Underscoring the interdisciplinary nature of aging studies, the book encompasses teaching strategies for instructors in such disciplines as Counseling, Family Studies, Gerontology, Geriatrics, Medicine, Psychology, Public Administration, Public Health, Nursing, Social Work, Sociology, Speech Pathology, and others. This peer-reviewed collection of hands-on activities is designed by noted educators in aging and incorporates AGHE competencies. It offers clear, step-by-step procedures for implementing each activity including preparation, introduction, the activity itself, discussion/reflection, wrap-up, and assessment. The book also addresses learning outcomes and includes recommendations for number of participants, settings, materials, and time required. Encompassing key, impactful issues affecting older individuals, the text examines Ageism and Aging in the Media, Dementia, Demography, Health Care, Housing, Physical Aging, Policy and Politics of Aging, Positive Interactions with Older Adults, and Spirituality. In addition to its value to students, the book's activities are also beneficial to professionals instructing or participating in staff trainings, in-services, and continuing education.